leonard published 8 years ago in Uncategorized. it was very dark this morning when I woke at my new home. no alarm clock, no early to bed, just a good old fashion gut check at 3am. the future looks pretty scary when everything is dark, and the only thing you have to comfort yourself is an iPhone that’s partially connected to the Internet. the Internet is not going to rescue me at this point, and make me forget everything, keep me company, how can it? I wondered around my dark apartment looking for something to distract me. as I walked down the stairs, I could see the silloutte of my single speed from the small night light plugged in just behind it. i love my bikes… all of them. I know that thou shall not covet… but if you knew me, and you know what my bikes and I have been through, you would understand. my bikes are beautiful, they’re tough. they are reliable, they nearly killed me, and in general they never let me down. I wasn’t planning to ride this morning, but just seeing my bike there made me think. you know, I don’t feel like doing anything right now but, if I don’t do anything, I will have done nothing. so, I gathered all my stuff. I don’t know my new neighborhood yet and I didn’t feel like exploring this morning, so I decided to ride somewhere familiar. I thought there was a chance to catch the sunrise somewhere, but i had to hurry. given the time I had till sunrise, flagstaf seemed like the perfect choice. 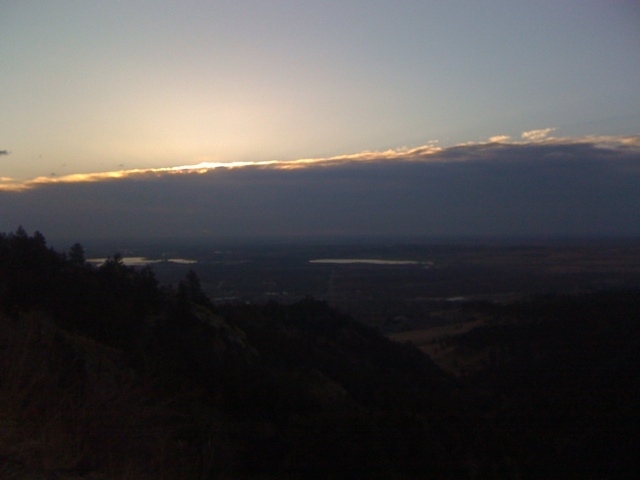 I hurried everything into my car, and drove up to boulder. i parked at the chautaqua lower lot and quickly got my bike out of the car. the sun would be up soon and i didn’t want to miss it. it looked as if i was going to be very close, so i hammered up the first part of the climb till my lungs were burning. i made it to the point just above the ticket booth and stopped there. a thin layer of clouds was just off the horizon, and it was blocking the sunrise. my heart was still beating pretty hard as i sat there on the side of the road with my bike on the ground. there was no beautiful sunrise for me to witness…. just disappointment. I sat there for a few minutes hoping that the sun would break through the clouds… but it didn’t. with my heart still beating I jumped on my bike and rode as hard as I could up to the top. flagstaf used to be my favorite climb in all of Colorado. it’s steep, it’s beautiful, and it’s full of life. it was my barometer when I was training…. it was my church, when I needed it. disappointed from the absence of the sunrise, I rode as hard as I could. I am not as strong these days, because I have been trying to nurse an injury, but i rode at my limit anyway. I got to the top and turned around. riding down I could feel everything. my big knobby tires on my single speed, created this tiny humming noise. I could hear it and feel it like it was a favorite song. there were hardly any cars around so I used the entire lane. I carved back and forth moving my knees from one side to the other. the gravity and inertia from so many little cutbacks started to make me feel good again. near the bottom, as I turned the corner to get back to the ticket booth… I noticed something. the sun was starting to rise above the layer of clouds. it was as if the sun was waiting for me. i had given up hope to see the sunrise this morning, and when i finished my hard work of going to the top and getting back, it showed up…. it showed up.